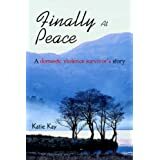 I have read the book 'Finally at Peace' by Katie Kay. It is rather a short book at 48 pages, but well worth the read. I wish she had written more as I felt that alot had been omitted. I felt a little cheated too in the way she managed to escape Domestic Violence in the ultimate death of the abuser in a motor accident. Saying that what was written was comprehensive and understandable. She developed a good emotional factor within the text and brought you directly into the middle of the action. I wonder what would have happened if the abuser had not died so untimely? I have not escaped contact with my abusers, but I am learning to control situations, so they can no longer control me. The reason they are still about? my children! I wish it could be that easy for victims/survivors, but it isn't. I am going to read a number of other books concerning DV,and will keep you up to date of their contents too. So pleased you have escaped domestic abuse. As a youngster I was lucky enough to have a wonderful warm loving family. I married someone that I thought was going to give me that same love, unfortunately this wasn't so although he was never physically violent. I went to work for Women's Aid in my sixties for six years and it was only then that I realised that the control over finance, friends etc. he had over me was just as abusive. I knew nothing about Women's Aid and it took me 25 years of marriage before I plucked up the courage to leave. There I discovered that it normally takes a woman around seven times of leaving and then going back before she has the courage to move on. The only advice I can give you is that if you are struggling to move on go to Women's Aid if it is only to talk to someone who can help you to find the courage to move forward with your life. I know it was another seven years before I could actually talk to someone about what my life had been like and the relief was amazing it really opened my eyes to my true potential, and a new life which I now love. Good luck and stay stron.